These newly evolved muscle car are really brilliant in their new shapes, even I, an aero -dynamic lover must admit I was amazed by the designs of the muscle cars today and one of those great designed cars is the 2009 Dodge Challenger somehow it looks a bit similar to its old self only it looks much smoother and tougher than its past version, its like a beautiful monster in the outside, while under the hood is a true superbeast waiting for you to unleash it. 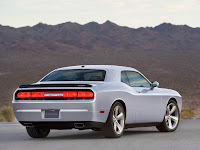 The Dodge Challenger gives you the satisfaction of a modern muscle car in an incredible value, this car is a 2 door 5 seater coupe that is a rear wheel drive, it offers 3 level of trims which all of the level are a definite head turner in design, power and price. 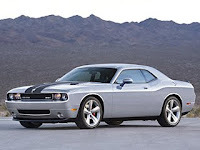 The first level is the Dodge Challenger SE, which is the base model that offers the lowest price Dodge can give, with a US MSRP of $21,995, the SE is equipped with a 3.5 liter V6 High Output engine that transmits through a 4 speed automatic transmission that enables it to produce a 250 horsepower and a 250 lb ft of torque, its fuel economy rates an estimated 18 mpg in the city and 25 mpg in the highways. 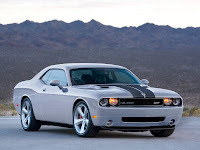 The second trim level is the Dodge Challenger R/T which cost around $29,995, R/T Equips a newly features new generation 5.7 liter HEMI V8 engine and when paired with its 5 speed automatic transmission it produces a 370 horsepower and 398 lb ft of torque, the standard 5 speed automatic transmission is packed with a new technology which is the Multi Displacement System (MDS) in which helps this car lessen its fuel consumption by 20 percent without degrading its performance. And if those numbers aren't enough for you, this third level will, the Dodge Challenger SRT8, which cost $39,995 this monster has a Red and B5 Blue exterior paint that is combined with a black hood stripes and what makes it even more monsterous is the thing under the hood which it equips a mighty 6.1 liter HEMI V8 engine and includes a classic "pistol grip" shifter that includes a track pak that has a Tremec TR6060 6 speed manual transmission with hill start assist that produces a 425 horsepower and a 420 lb ft of torque, and new for the 2009 model is the standard limited slip differential.